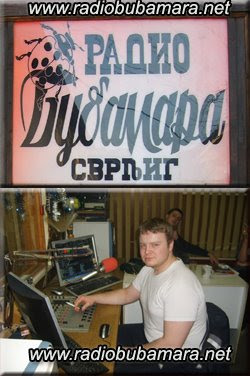 In May 2008 I visited a little Serbian FM-station Radio Vladimirci (www)with extreme-DXer Jim Solatie (Espoo, Finland). I heard this station here in Finland on August 2007 (mp3). When we visited the station, Sandra was on the air (click the photo>). Now, on Christmas day 2008, I got a nice Xmas-card from this station (see below)! Vladimirci is broadcasting on FM on 89.6 MHz to a very little Vladimirci-city (only 1.900 people, 20 000 in the whole municipal). According to the photos found from internet this station seems to be very lively and going strong. This month I e-mailed reception reports to 35 Italian FM-stations! I got 17 replies back!! All very nice and clear confirmations of my listening. Thanks to all stations who kindly replied!!! Now I have totally 305 Italian FM-QSLs!!! 225 of them are letters (with stickers etc.) between years 1985-2000 and last 80 QSLs are e-mails from this century. Filippo Rattile from Radio Blu made nice story of me to their web-page and blog. Nice surprise!! - Radio Argento, Monopoli (BA) - 95.4 MHz. I have heard this station many times. - Radio Citta Futura, Bari (BA) - 101.0 MHz (www). Big website. - Radio Parma, Parma (PR) - 102.0 MHz (www) I mailed them very old clip, from 1983!!!! This seems to be a big tv-station! - Radio l'Olgiata, Roma (RM) - 96.6 MHz (www) Started 1975 !!! - Radio Delta, Rovigo (RO) - 103.6 KHz (www) Very big station! There are more to come... It is great to give a surprise to stations that they have been received in Finland on FM. Last week I got a nice reply, written in Serbian, from Radio Bubamara (www), from a little town called Svrljig. There are only 7 700 people living in this town (17 000 in the whole municipal) and it is located 30 km NE from a big city Nis. Radio Bubamara is the first local private radio station established in south east Serbia !!! It began official broadcasting in 13.May. 1992 and it is owned and operated by Joca & Milos Miladinovic. I heard this station on 93.5 MHz last summer. Now they have noved to 96.5 MHz. In the reply they wondered the weather conditions bringing their signal up to Finland. On Sunday evening 7.12.2008 I sent e-mail to a few Greek FM-radio stations about their signal in Finland! 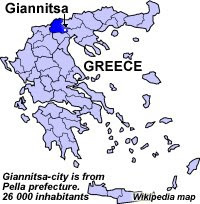 I got one nice reply from Radio Toxotis FM (www) from a little town Giannitsa, from North Greece. There are about 26 000 inhabitants in this city. The station-owner kindly confirmed my old clip from summer 2000. Here my mp3. This seems to be quite big commercial city-station according to their large web-pages. There is a lot of information. I think I have heard this same station in mid 1990's under name Radiofonikos stathmos Toxiatis on 96.7 MHz (mp3-clip), but I did not have any comments of this reception from 1994. 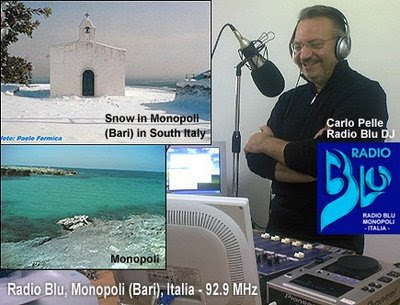 During the first week of December I e-mailed 22 reception reports to Italian FM-stations!! I will write here the results very soon. How many replies I will have? Also I will mail Greeks later. This is very good tuner even for experienced FM-DXers. It has good sensitivity, signal separation in tight places, like 0.1 MHz, and it gives good audio. There has been no conditions to test it well, but I suppose this will be n:o 1 tuner in ythe coming summer-Es-skips. Very interesting. The price is only 80 - 100 USD + post (about 50 USD) + taxes. Total around 100 euros. This model is sold only in US market with digital HD-radio system and 10 khz AM-steps. But it is worth of ever cent ! August 2008 has been better than expected. This Sunday we had first some Serbia/Kosovo-signals and then opening to Rome, Perugia and around! Quite strong and stabile signals for some time. 90.7 MHz - Tele R Stereo 2, Roma, Italy. 14.8.2008: Istanbul FM-stations audible in Finland! Istanbul FM-stations were audible in South Finland with strong RDS-stereo-signals for 2-3 hours. The band was full of Turkish-stations up to 108 MHz after midday UTC! However, here in SW Finland the opening was not as good as around Helsinki. Signals were mostly weak over 101 MHz here. There are even 103 legal FM-stations in Istanbul (listed here) !!! One "funny" thing was that I identified all 3 Istanbul "Powers" around 100 MHz: Power Türk 99.8, Power FM 100.0 MHz and Power XL on 100.2 MHz !!! Also Italians and some other counties were shortly up before Turkey. I drove from work to listen for some time, but nothing exceptionally interesting was not heard by me (I mean stations "never-heard-before in Finland"). Very interesting and surprising condition in August, not expected! On Tuesday evening 12.8 and Wednesday 13.8 afternoon Southern Italy was open to South Finland. I missed the 13.8 at work. A lot of networks were id'ed here. I missed the Italian stations at work on 13.8.2008. It was better opening, but not good one. 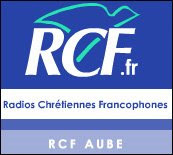 90.7 MHz - Fun Radio Bourgogne, Dijon (21). 102.6 MHz - France Bleu sud Lorraine, Nancy (54). Also I identified many NRJ, Cherie,Skyrock etc. but I hunt only local stations. This summer has been one of the worst Es-seasons so far, especially for the time around mid-summer, which has normally been the best time for that! After 8th June there has been Sporadic-E on FM only on three days: 25 and 26.6 and 2.7!! Last over 3 weeks 2.7 - 26.7.2008 have been silent!! Incredible! We have still some time, until the end of August (which is usually the worst after June-July) but this does not look good! One nice thing is that Es does not disturb workdays. I am now building new FM-station to Turku. On Thursday 26.6.2008 was the best FM-opening so far here in SW Finland. The conditions started at 05.50 UTC and fade away at 09.15 UTC. Also some more weak signals later during the day (mainly France). I identified many new Greeks which are observed first time in Finland. There were also some Turkish, Bulgarian and Serbian stations - even Albania. Also Radio Prizren from Kosovo on 88.4 MHz was a nice surprise! This June has been very poor for Sporadic E, perhaps the worst ever. I was away from home (not a chance to DX) for two weekends etc., but there were no conditions!! The FM-band was empty between 8.6-24.6.2008!!! This has usually been the best time for the Sporadic E-skips, but this year nothing! On 26.6.2008 I heard several stations widely accross Europe. Weak and short skips!! The first good Sporadic E-opening for me was on the 28.5.2008. Utö FM-DX-blog to a separate blog! I moved all Utö FM-DX-data to it's own blog-address www.uto-fmdx.blogspot.com. So, everybody can check circumstancies for FM-DXing in Utö island from there - and I can update this FM-blog separately. 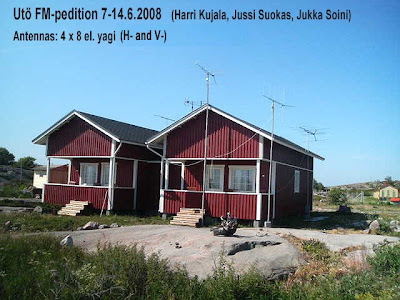 We were listening FM in Utö for one week - 7-14.6.2008. I visited Serbia for one week (17-25.6.2008) with another fanatic DX-er Jim Solatie (from Espoo, Finland). We visited 19 FM-stations in Central-Serbia and fetched QSLs for ourselves and our DX-friends in Finland. Here is a report of this busy week. There have been hundreds of FM-stations broadcasting without license for many years. The things are now chancing. Forexample in Belgrade over 10 stations are closed within 2 years. Serbian broadcasting authority has just published a list a frequencies and new license holders for the whole country. About 2/3 of the stations broadcasting today will be closed down. Forexample only a few frequencies will be given to Pozarevac where even 20 stations are now on the air!! The MD of Boom 93 (Pozarevac) said that the illegal broadcasters will have heavy penalties. The owner will get 7000 € and the station separately 15000 € penalty! We will see if they will really raid the stations, especially in the countryside. A few stations we visited, were already closed down, or will lose license - or they even have to move to new area!! It is supposed that most of the stations without a license will close during a few next months. This means that Serbian FM-radio will be less attractive in the future! So, this was the last chance to visit many of these stations! 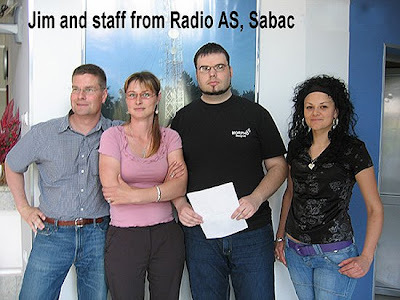 Sabac 19.5: - Vikom Radija 91.1 MHz (QSL to JMS, HKU e-mail). This station was closed but we found the mother of the owner from the old address and phoned him! Mother wrote QSL after phonecall and she found us also big old RTV Vikom-stickers! Bogatic 19.5: - Radio Nesvil 93.2 MHz (QSL to HKU, PÄ). Real countryside station. The owner found my old C-casette/report. Very poor audio now on their signal. Vladimirci 19.5 : - Radio Vladimirci 89.6 MHz (Heard by HKU). Small countryside station. Koceljevo 19.5: - Tim Radio 91.7 MHz (QSL to HKU, JMS e-mail before). The sexiest station ever seen!! 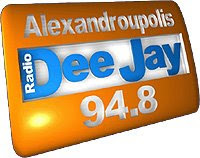 - Radio Desetka 91.9 MHz. Station was closed. One sticker was found from the window of their ex-office! Lazarevac 20.5: - R. Kiss 87.6 MHz (JMS had e-mail-QSL before and his photo was on the wall!!). Pro station for younger people with nice jingles! - Radio Lazarevac 89.3 MHz . We were interviewed to the programme (QSL to HKU). Jim's family arrived to Belgrade so I visited 3 stations alone on 22.5. We are listening FM in Utö-island (map) for one week. Listeners are Harri Kujala (HKU, from Naantali), Jukka Soini (JJS, from Kurikka) and Jussi Suokas (JUS, from Joensuu). We have four H- and V-antennas (4 x 8 el. yagi) with amplifiers. QTH is nice cottage (own kitchen, WC, bedrooms) close the sea with open view to S and SW. The cost of this is 100 € / night. Seems to be good place for FM-DXing. NICE OPENING TO SOUTH ITALY from 16.40 to 19.00 UTC. I am going to Serbia, 17. - 25.5.2008 !! I am going to Serbia in May 17-26th, just before and during Eurovision Song Contest in Beograd. I will visit many local legal FM-stations (at least 10 stations) in Beograd and in smaller cities around the capital. I will do that trip with my DX-friend (Jim from Espoo), so it will be radio 24h, FM- and pirate-radio. We hope that we can be on the air on some bigger MW-pirate radio from Serbia on some late evening. It could be interesting to try to reach Europe from Serbian pirate between 1600 - 1700 kHz! I will inform here about the possible broadcast from Serbia. It would be fantastic to take GSM-phone-callings and reports during the brodcast. The happenings in Serbia does not look good just now. I hope everything will go better because we have already booked the flights! !